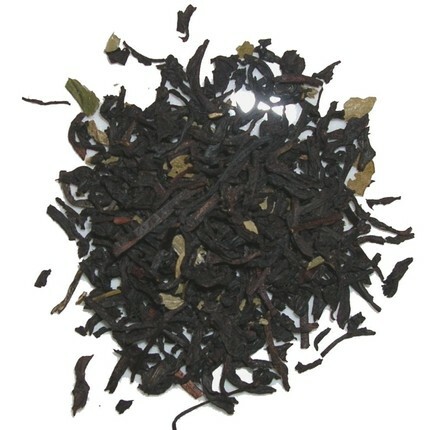 Black Current tea is a black tea blended with natural black current flavoring and currant leaves. Orange Pekoe refers to the size of the leaf, not the quality or flavor. This grading means whole leaf. Contrary to popular belief, the term “orange” does not refer to a flavor, but rather to the Dutch House of Orange. I am really enjoying this tea! The black tea is very smooth and mild. I am not detecting much tannic quality at all, just a rich black tea flavor without the astringency I would normally associate with black tea. It’s really a nice change. I don’t usually mind astringency so long as it doesn’t detract from the flavor of the tea, but it is also quite pleasing to find a black tea without a strong, astringent nature. The black currant tastes very yummy – sweet, juicy and berry-like. I’ve never tasted a fresh black currant (at least, not to my recollection) – so I can’t say whether or not it tastes like a fresh black currant, but it does have a fresh and juicy flavor to it that reminds me of fresh berries, but without the tart aftertaste. It also has a somewhat sweeter flavor – similar to what I would find in dried fruit. The finish is smooth and sweet with just the tiniest twinge of tart to it right at the tip of the tongue. It is far less tartness than I usually experience with berry flavored teas – or with currant flavored teas, for that matter. This tea is so delicious. I really like it iced – the mellow flavor is perfect for relaxing on a hot, summer afternoon. While it doesn’t need sweetening when it’s served hot, when chilling it, I do recommend adding just a little sweetener (I used agave nectar) because it helps the flavors really come alive. A really delightful tea from Sahara’s Supplies!